What Lifting Iran's Sanctions Means For U.S. Businesses The recent nuclear deal covers only a fraction of U.S. sanctions against Iran; most of the restrictions on businesses will stay in place. But there are exceptions. Who will benefit? 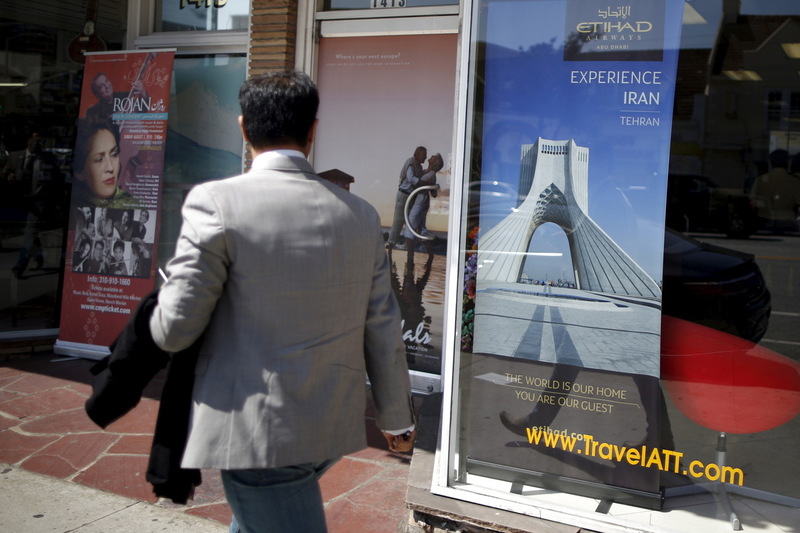 A man walks past a poster advertising travel to Tehran, Iran, in Los Angeles on July 14. A nuclear deal between Iran and six world powers lifts some sanctions against Iran, but most U.S. sanctions will remain in place. Since news of the Iran nuclear deal broke, lots of business clients have been calling up Washington lawyer William McGlone, a specialist in trade law and economic sanctions. He says he's been forced to give them a bit of a cold shower. "There's this expectation, or assumption, in the business community that the sanctions are being lifted," he says, "when, in fact, the U.S. legal framework is scheduled to remain in place." Only a small fraction of U.S. sanctions — the ones related to Iran's nuclear activities — will be suspended as part of this deal. Sanctions related to terrorism and human rights, enacted by Congress beginning in 1995, will stay put. McGlone, a partner in the firm Latham & Watkins, says those sanctions include strict prohibitions. Lifting Sanctions Will Release $100 Billion To Iran. Then What? "As a general rule of thumb, any U.S.-based business and any U.S. person, unless specifically authorized, will be precluded from doing any business in Iran," he says. That includes U.S. oil companies, banks and consumer-goods firms. A senior Obama administration official put it this way in a briefing with reporters: "We are not removing our trade embargo on Iran." "U.S. persons and banks will still be generally prohibited from all dealings with Iranian companies," he continued, "including investing in Iran or facilitating third-country trade with Iran." There is one big exception: the civil aviation industry. Once inspectors have certified that Iran is complying with the agreement, likely sometime late this year, companies such as Boeing will be able to sell civilian aircraft and parts to Iran. Industry officials say that could mean sales of 400 aircraft worth $20 billion in the next decade. A Boeing spokesman said the company is reviewing the agreement, but Boeing won't comment until the U.S. government gives further direction. Outside of civil aviation, there are exceptions for foods and medicines — which the U.S. has previously allowed to be traded — and some potential loosening of restrictions on foreign subsidiaries of U.S. firms. Otherwise, U.S. companies will still be frozen out of Iran's market. It's a different story for European companies. "I think the practical reality is the Europeans will be there first," says Vanessa Sciarra, vice president at the Emergency Committee for American Trade. Sciarra points out that Europe's sanctions, which are far less extensive and longstanding than U.S. sanctions, will be lifted quickly. European oil producers have said they're eager to return to doing business with Iran's oil industry. French automakers are also anxious to return to Iran. Despite the frustration at seeing their European competitors get a head start, Sciarra says many U.S. businesses are still hopeful. "Cautiously optimistic," she says. Sciarra says many of her member firms hope and believe this deal is just the beginning of a broader opening, and they'll lobby hard to remove the extensive array of U.S. sanctions. Lawyer McGlone is skeptical. "At least as of now, I think it's prudent to assume that there's still very strong bipartisan political support for maintaining the core of the longstanding U.S. sanctions against Iran," he says. McGlone says he thinks there would have to be a sea change in U.S. politics before the core U.S. sanctions against Iran are lifted.